Part of Biome’s service is to trial every product for you! We’re always excited to test how a product works and what effect it will have on our personal lives. 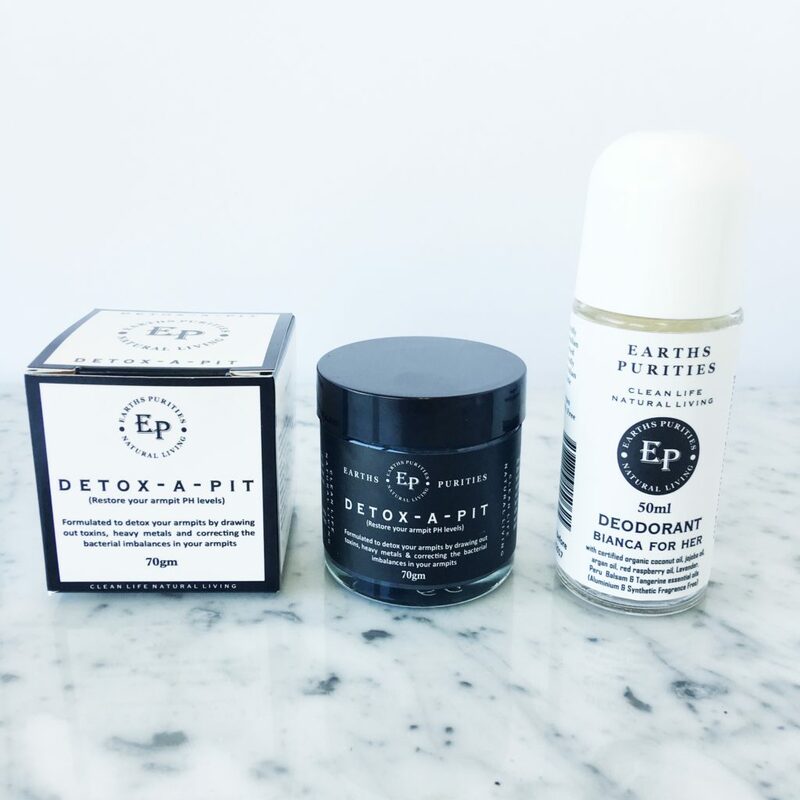 Recently, we trialled a new product from Earth Purities called Detox-A-Pit. Of all our natural skin care, natural deodorant receives the most diverse feedback. Finding the right deodorant for you is definitely trial and error because everyone’s body chemistry and daily activities are so different. However, we encourage you to keep looking for the natural deodorant that works best for you because the aluminium versions are so toxic and worth eliminating from your life! Here’s our bare all, honest experience. In summary, we absolutely think Detox-A-Pit is worth adding to your personal care. As the name suggests, Detox-A-Pit was developed to help detoxify your underarm area, particularly for those changing from conventional deodorant to the natural variety. Beyond the initial detoxification, it is also great for keeping the underarm area in optimum health. As you may have experienced, changing from conventional to natural deodorant may lead to some irritation, increased sweating or odour. This is a common reaction during the transition process, and isn’t necessarily the new natural deodorant causing this, but the health of your armpit (after releasing the toxins and heavy metals that have been trapped for so long by antiperspirants). With ingredients such as bentonite clay, activated charcoal, organic apple cider vinegar, colloidal silver and coconut oil, Detox-A-Pit claims to magnetically draw out toxins and impurities, eliminate irritation and redness, and best of all, eliminate odour! There are two stages. For the first week, apply a small amount of the Detox-A-Pit mask under your arms for 10 minutes each day, wash off with warm soapy water, then apply a natural deodorant of your choice. After the first week of detoxing, use the product once a week for maintenance. This product smells very… unique. Mainly due to the apple cider vinegar. And the paste is black from the charcoal, so you may get some funny looks if you are doing this at home with people around. Persevere though, it is worth it! Michele had already been using Black Chicken Remedies axilla deodorant paste for two months before trying Detox-A-Pit. Michele is at the gym four days a week, drinks around four litres of water a day, eats fairly well, and considers herself a bad sweater (weirdly, with one side worse than the other). It is certainly an interesting product! When I changed over to natural deodorant two months ago, I did not experience irritation, notice any excessive sweating or bad odour, so I wasn’t looking at Detox-A-Pit to fix that issue. The idea of drawing out toxins and maintaining my overall health and wellbeing was certainly very appealing though. Upon using Detox-A-Pit the first night, I felt really fresh and clean afterwards, it was fantastic. I could really tell that something was working. The same for the second and third nights. Although there was still wetness, the odour wasn’t bad at all, and by the end of the day I was feeling fresher than I had been. One thing I did find hard was waiting for 10 minutes each night as it did its thing! I am restless, so I cleaned the bathroom a few times, and another time I just did squats! Unfortunately, by about the fifth day I noticed my underarms were becoming itchy. This may have been part of the detox process, or I may have been reacting to something, I’m not sure. To be cautious I stopped using the product and the itchiness stopped. While I did have a bit of a setback with the itchiness, I will not stop using it permanently, because those first few days were fantastic. So to detoxify my underarms and to maintain overall health and wellbeing, I will continue to use it once a week or so. Nancy uses conventional deodorant. She has tried several natural deodorants but has not had much success so far. Nancy has a busy and sometimes stressful job as the Retail Operations Manager for Biome, so feeling fresh and confident is important. Nancy’s daily exercise consists of walking her gentle giant, Bob, twice a day. Her diet isn’t that bad, but she leans towards a variety of liquid made from grapes. Because of this she feels that the detoxing process might have taken a little longer than Michele’s. Because of the smell, this product takes a lot of getting used to! The first morning I applied it, I left it on for 15-20 minutes, washed it off and then followed it with Earth Purities natural deodorant. By the end of the day I was smelly. This was the same for the second day too. I persevered and by the end of the fourth day, the odour seemed less obvious than the first two days, which was encouraging. By the fifth day I could really start to feel this work. I had a big day out and about, it was a warm day too, and I was so impressed that my body odour was minor. Normally I would use a chemical deodorant throughout the day to freshen up, but I applied Earth Purities natural deodorant only once in the late afternoon. On the sixth day of using the product, I had a big day at work, and I still remained fresh and non-smelly. It has been about nine days now and I feel I am not sweating as much, although in the afternoons my underarms struggle with wetness. I usually just reapply some natural deodorant when this happens. I’m not used to that wet feeling, but I may still be going through the detox process. I’m quite happy and impressed by this product. I will continue for the next week to see if the sweating becomes less and if the odour lessens even more. Brisbane summer will be a test. Stay tuned! Hi Elizabeth, thank you for your comment. We have actually reached out to Earths Purities as well as a naturopath to get the correct information for you. In this instance it would be best to lean on the side of caution and not use it while you are breast feeding. From information we have gathered, detoxing of any kind is generally not recommended during pregnancy or breastfeeding, as there is the potential to dislodge some heavy metals/toxins in the body and then pass them to bub through breast milk. It would be best to seek advice from your GP though. Kind regards. Thank you for the reviews. I will wait and see how others go before I use this one. The Black Chicken paste caused burning to my underarms – it peeled too. Now I am reading it may have been the heavy metals etc so maybe I can try this one and see how it goes. However, I’m leery of doing so until I know others aren’t having extreme reactions.